I was recently asked to speak at an away day for the marketing team at Ernst & Young. I was delighted to help and was really impressed with the level of engagement and discussion around differentiation and the contribution of marketing to the business. Professional services marketing can often be a difficult area but the team seemed really fired up to make a difference. Here is the slidecast of the presentation I gave. View more webinars from Justin Basini. If you have any thoughts on professsional services marketing or any of the themes in the presentation then please reach out to me or comment below. And if you want me to speak at your event please email me. 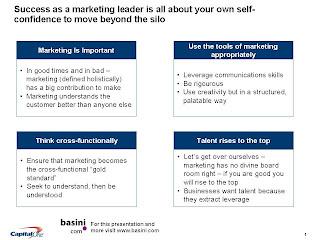 Leadership in Marketing: from shareholder value to stakeholder value. You can see the presentation at my slideshare site. The presentation can be summarised through the following themes. Marketing has been fantastic at creating consumption which has been the engine of the increase in material standards of living in the West. But that consumption in its current forms is becoming a drag on well-being not a way to increase happiness and well-being, it is also massively unsustainable as populations grow and more aspire to a consumer lifestyle. This together with the increasing sophistication of marketing, cynicism of the media and lack of understanding of why business exists means that trust has been eroded. Marketing is at some level culpable for the over-consumption that is an acute threat and more generally consumption which is a chronic threat. Leadership in marketing will be seeing these issues and responding to their challenges in a way that can restore trust and legitimacy for brands, business and marketing. Some of these themes have been recently covered in an article that I contributed to in Marketing Week and also much of this thinking comes from the other blog I founded: www.conservation-economy.org. Please if you have comments or thoughts please share them. It’s just been confirmed that I’m going to speak at the 3rd European Chief Marketing Officers Conference in Zurich on the 30th September. I attended last year and you can read my thoughts here. I’m going to speak on re-thinking marketing as a driver of humanity in business. If you’ve got any ideas on this then please drop me a line! The Conference is a great opportunity to network and interact with true leaders in our field so I hope to see you there. Spoke at a conference this morning for the IBDG. This was a conference for Marketing Directors from different industries and sectors. Humbling to address. Enjoyed it as always. Overall clearly marketing (defined holistically as discovering consumer needs and meeting them) is important now and in the future. I closed with this chart which gives a sense of what the good marketer could do more of…. Good luck to all the marketers out there – I know it feels tough but keep the faith!